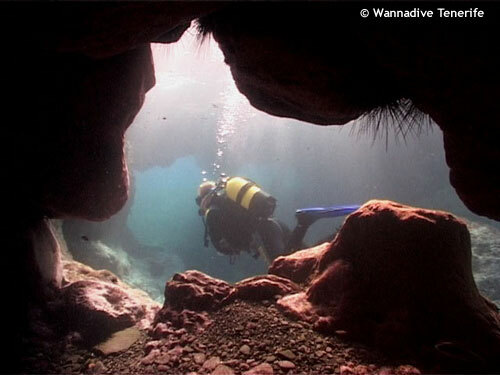 El Balito offers caves, caverns and one fantastic swimm-through in which divers can surface and admire its brilliant ceiling. El Balito is a very unusual site situated 30 minutes by boat from the Centre. The bizarre rock formations and caverns were the back-drop for the BBC TV series "Walking With Monsters". Life here is hidden amongst the shadows created by giant boulders and crevices, so a torch is particularly useful on this dive. Sea-anemones of a variety of colors live in symbiotic harmony with their Lady Scarlet shrimps, sea sponges encrust the many caverns and attract thousands of shrimps, crabs and lobsters. At a swim through at 28 meters there is a chance to see stingrays but the highlight of this dive is a large mysterious cave at 6 meters with a tunnel in which the diver can surface, in a shimmering Jacuzzi of light shafts and bubbles!